Prototype of a female robot. Spottedville officials have had enough of a sudden increase in specific racially-motivated crimes. According to Mayor Jenny Smith, "You usually don't hear much about anti-white racism, and it isn't politically correct to mention it. We had to do something." There was a huge spike in racially motivated violent and sometimes fatal assaults against Caucasian females over the last two years, according to local experts. Dr. Todd Adams of the nearby university says, "I had the students who discovered this trend to check their figures over and over, and according to police records, these crimes had indeed spiked over 500%. So the technology department had an idea using robotics that the police could try." According to Dr. Joe Daniels, "We thought a new, realistic robot would help curb this problem." 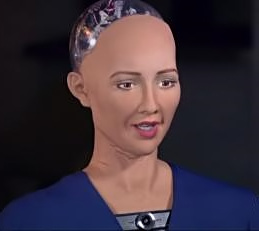 The robot completely replicates a Caucasian female in features, movement, voice, height, anatomy, etc. She is also equipped with hidden surveillance equipment and various deterrents. Daniels says, "I won't go into specifics, but it incorporates various weapons including drugs, sharp objects, explosives, and firearms, all placed in strategic locations. The whole thing is operated by a combination of computer logic and remote control." Police may employ the robot in high-risk areas where the attacks occur. Det. Jim Bronson says, "This is a new tool in our arsenal, and this robot has other uses. It can perform CPR, silently contact 911 in certain emergency situations, befriend wandering or lost children and help them to remain safe, and even help talk suicidal persons off of ledges." Local civil rights groups have their concerns. "What if this robot explodes on someone having consensual intimate contact with it?" asks Keshia Brown of the Black Advocacy Alliance chapter. "Besides, why aren't there any Black and Asian female robots of this nature? Aren't all women worth protecting?" Bill Smith of Stop Capital Punishment Now expresses concerns that this robot could become a vigilante or administer capital punishment. "What's the difference between this robot and a terrorist? Anyone who has control of this robot can execute anyone they desire." Bronson says, "Yes, there are concerns that this robot will be misused, but our department will take every possible precaution. Our main concern is our women and girls, so we need to do whatever it takes to deal with these violent predators. These robots will start with non-lethal deterrents when under attack, and then escalate if the attacker does. "Under the law, they will receive the same protections as police officers. As long as the robots announce themselves as officers before taking any actions we should be free of liability."